Electro-Harmonix’ Big Muff series are anything but new. These pedals were at the forefront of overdrive and distortion for a long time. What makes Little Big Muff so impressive is the fact that it offers a vintage experience molded into something that is fairly modern. This is essentially the same legendary Big Muff that is smaller, easier to handle and more inline with current pedalboard standards. If you are looking for something that is versatile, vintage and generally powerful, Little Big Muff Pi might just be the right solution for you. The whole vintage vibe of Little Big Muff isn’t only limited to its tone. 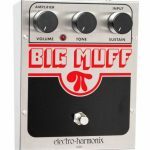 For those who have followed Electro-Harmonix over the years, it comes as no surprise that they have used the exact same type of design for Little Big Muff. Essentially, we are looking at a cast metal chassis with very limited finish and not much else going on. It is that same rugged look that we have grown to love so much. The main difference between the original Big Muff Pi is the size of the chassis. The original was massive, but that didn’t really matter much at the time it came out. Today, things are very different. Since a good majority of guitar players rely on their effects pedals, Electro-Harmonix had to redesign the legendary Big Muff Pi in a way that makes it compatible with current pedalboard formats. That is exactly what Little Big Muff does. This is one aspect of older Electro-Harmonix designs which you definitely don’t need to worry about. Little Big Muff is virtually indestructible. With a thick die cast chassis, it is more than capable of taking whatever punishment and abuse you can dish out on a daily basis. Its finish, the very limited amount there is anyway, is extremely easy to bang up, but the internals won’t suffer at all. Some would even say that putting a few scratches on the outside gives the pedal a more personal character. That however, is up to the user to decide upon. One glance at the control panel of Little Big Muff is enough for anyone to realize that it is a no-nonsense pedal. There are no dozens of knobs, no additional buttons, just the bare minimum that works as it always has. Under the hood, the circuitry is pretty much the same as original. Everything is analog, just smaller. Electro-Harmonix has built in a true bypass switch, which is something we would have expected anyway. In terms of power supply, you can either run the pedal on a battery or on a power adapter. When it comes to which of these methods is better, we’d have to go with a 9V battery unless you have a really good power supply. Features pretty much end with this. There’s nothing abnormal or unique to be listed, just the good old Big Muff package. Performance wise, this pedal is a true time machine. When Electro-Harmonix first released the Little Big Muff, there was some justified skepticism among their user base. People were wondering if by making things smaller, Electro-Harmonix might change the way the pedal sounded. Fortunately for us and everyone else, those fears were misplaced. Little Big Muff brings on a ton of heat and that legendary creamy tone. Some like to describe it as a fuzz pedal, while others, including us like to think of it more as a distortion pedal with a unique tone. 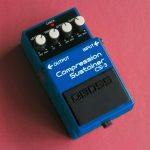 What makes it really special, aside from its unique flavor, is the fact that Electro-Harmonix managed to squeeze in a proper sustainer in there. Unlike it is the case with so many other pedals, the sustain knob on Little Big Muff actually makes an impact. Let’s touch upon the range of this pedal. We have already mentioned that controls are nothing special in terms of what you get to mess with. However, the stuff you do have access to is incredibly sensitive. Little Big Muff has such a broad range that even the smallest adjustments to the controls can have dramatic effect on your tone. This is both a good and a bad thing. On one hand, you get plenty of bang for your buck, which is something we can agree is awesome. On the other hand, trying to make adjustments mid performance might prove to be extremely hard. To put it simply, Little Big Muff takes some getting used to. Check out this video demo by Youtuber schnobel, who gives us a real taste of what this pedal has to offer. With everything said, it isn’t hard to see why certain guitar greats, such as Dimebag Darrell, chose Little Big Muff as one of his main distortions. 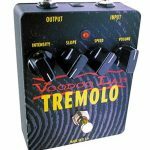 This little pedal was simple, extremely rugged and capable of delivering a massive tone. With his adamant attitude towards gear, all that extra range Little Big Muff offers seems to have been a perfect fit. There is another benefit to this as well. Those who are not only interested in face melting metal can dial in a completely different sound. This pedal is perfect capable of being subtle if you want it to. All it takes is a bit of time to find the right setting, and a bit of skill to get there. In essence, Little Big Muff is one of those tools that every guitar player should have.